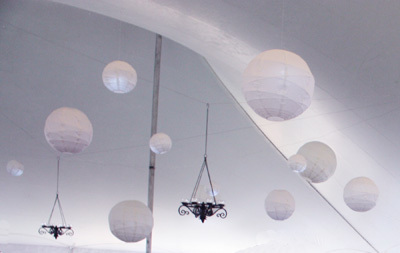 The Carolina Table: East Meets West under a ginormous white tent. With chandeliers … jumping the cool factor a couple of notches. Daniel Wallace introducing 27 Views of Chapel Hill: A Southern University Town in Prose & Poetry. Family-style dining prepared by the likes of Stephen Ribustello from On The Square (Tarboro) and Jacob Sessoms from Table (Asheville). Plus food artisans from the Piedmont – Chapel Hill Creamery, Farmer’s Daughter, Big Spoon Roasters and Carrboro Coffee Roasters. Ending with dessert from Jael & Dan Rattigan from French Broad Chocolate Lounge and a Working Man’s Lunch beer, a MoonPie-inspired beer brewed with Escazu chocolate from Full Steam Brewery. I don’t even like beer, but I loved this. Especially when it’s handed to you by the irrepressibly handsome Sean Lilly Wilson. Oops, did that sound sexist? Really? Guilty as charged. Something about MoonPies and good lookin’ men in the same sentence … well, I won’t go there. And did I mention wine? Oh, yeah, there was wine! Perfectly paired. Saturday: TerraVITA’s Colleen Minton and her staff really outdid themselves this year. The Sustainable Classroom sessions on Saturday morning were perfect in length. I was especially proud of Mary Margaret McCamic! She was a colleague at A Southern Season, and a wine expert in her own right as an instructor at The Chef’s Academy in Morrisville. There wasn’t a single snob factor in the room … oh, wait … there was that one guy who decided to announce that terrior didn’t really exist. Now that was a moment. And there was the girl who had the dropsies … first her wine, then everything she had with her. I know, I know, I shouldn’t talk … after all, I was the one who accidentally tipped the glass of red wine all over my leg. Eau de Pinot. I might be on to something. Great fun! Wonderful nibbles prepared by chefs who love what they do. Wine in abundance. Shared with comrades-in-arms. Kudos, Colleen and team!! This entry was posted in A-Musings, Food and Wine. Bookmark the permalink. Whoooowhheeeee honey you havin you a damn fine time! Good karma, just collect it and henjoy!